Northern Georgia, and namely, the Helen area, is the perfect spot for nature lovers to get away from the stress of every day life in the "big city" and get back to the basics. In addition to a number of other popular Helen Georgia attractions, state parks like Smithgall woods are extremely popular with vacationers who are staying in the area. Regardless of what your interests are, you'll find a wide range of opportunities for fun and exploration while paying a visit to this 5,664 acre park facility. This comprehensive guide will walk you through the possibilities and help you to plan your day at Smithgall Woods State Park. The history of Smithgall Woods speaks of ruin and of a new beginning. When first located by gold miners back in 1829, the area was full of wildlife and lush forest. Along Dukes Creek, small towns were crafted to house the miners. For the next few years the miners feverishly panned for gold. Then, in the 1850s the gold miners introduced the use of hydraulic mining. With this new technique, the landscape was soon transformed from bountiful to desert-like. Due to it's destructive nature, hydraulic mining was banned in the 1880s. Afterward, the area slowly began to recover. In the 1940s, a local radio station owner by the name of Charles Smithgall, became interested in the land throughout White County. With the sale profits of his media properties, he purchased 5,500 acres of land and spent over $20 million of his own money to help restore it. He then donated the land to the state of Georgia in 1994, where they have since concentrated their efforts to preserve and protect the land. This land is known today as the Smithgall Woods Conservation Area. Looking to get some fresh air and exercise? The many opportunities for exploration in the great outdoors is one of the largest Helen Georgia attractions in and of itself. Smithgall Woods offers no shortage of chances for discovering nature through hiking and biking, featuring some 23 miles of roads and trails with varying degrees of difficulty. This easy .3 mile trail will give you a nice view of the Dukes Creek area. It is also an excellent place to picnic and enjoy the outdoors with your family. You will learn the history of Cathy Ellis along this short half mile trail and witness the same beauty that she fell in love with. The trail travels downhill to a beautiful waterfall and along the way you will find remnants of gold mining history. On this easy .55 mile nature trail, you will walk alongside a fascinating wetland area and a beaver pond. It is a great place for watching birds, waterfowl and frogs. All of which, makes this a fun trail for children and adults alike. This .9 mile loop will take you across Dukes Creek on a wooden bridge and lead you to a historic vertical shaft used by the miners from long ago. Since then, bats have made this their home, so keep your eyes open and you may see a few. For a moderate hike, this trail will take you 1.6 miles to Laurel Ridge where you can witness the stunning beauty of Mt. Yonah. On this 3 mile round-trip hike, you will travel through the beautiful woods of Smithgall and throughout the Dukes Creek area. Be prepared for a rugged trip and some wading through the creek at the north end of the trail. Visitor's Center Loop Trail, for instance, offers a leisurely stroll with views of Duke's Creek and rare Florida Torreya trees. The trail offer offers picnic tables and adult swings for relaxing. Ash Creek Trail, on the other hand, is much more rugged and provides hikers with incredible scenery, including the creek and the surrounding forest. One of the favorite trails, though is Martin's Mine Trail where you'll encounter an abandoned gold mine shaft that has become a very unique habitat and hot spot for local bats. One of Helen's biggest draws is its supply of trout in the gorgeous Chattahoochee River. Although trout can make for a tasty entree, many vacationers to the area are simply looking for sport. If this rings true for you, Smithgall Woods State Park is the perfect spot to cast your line. While visiting the scenic park, you can enjoy some quiet time alone or bonding time with your family and friends as you sit along the banks of the river for a morning or afternoon of catch-and-release fishing. Be sure to make advance reservations with the park. If you take pride in living off the land and hunting your own game, you'll want to consider visiting Smithgall Woods during the various hunting seasons throughout the year. You'll have the opportunity to track and hunt a variety of game ranging from small fur bearers and turkey, to larger deer and even bears. Test your skills with a bow and arrow during archery season, using primitive weapons, or practicing your aim with your rifle or other firearms. If you're lucky, you might be able to bring something back to your cabin to cook up in your kitchen or on your outside grill. Smithgall Woods State Park offers a wide range of educational opportunities throughout the year for locals and vacationers to enjoy. It's easy to check the park's calendar or contact the visitor's center to learn which activities will be occurring while you're in the Helen area. Depending on the month or season, you might enjoy wildflower hunts, bird watching, children's events, information and events related to the gold rush and earlier settlers, and more. Hardman Farm is a satellite site of Smithgall Woods. Like many other Helen Georgia attractions, the 162 acre farm is a well-preserved historical site, offering a sense of rich culture and intrigue. The farmhouse was constructed in 1870, and was donated to the state of Georgia in 1999. The area contains a well-known Nacoochee Indian Mound. Smithgall Woods offers tours of the 19th century working farm on Sundays from 1PM-4PM. Throughout recent years, geocaching has grown in popularity, and the Georgia State Parks system - including Smithgall Woods - welcome and encourage the activity as a means of making the in-park experience even more enjoyable. In geocaching, a small capsule (or cache) containing a token is placed at a specific set of GPS coordinates. The coordinates are posted on a geocaching website, and hunters can set out to search for the treasure within a certain locale (i.e. : Smithgall Woods). Once found, the discoverer may take the token and replace it with one of their own for the next hunter to find. All you need is a working GPS system or a smartphone. There are even geocaching apps available for added convenience. 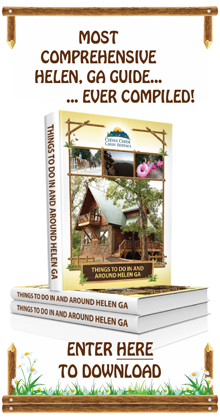 If you are planning to visit any of the Helen GA attractions, now is an excellent time to do so. You can hike, bike and fish without the worries of being rained out or having to deal with the heat. The calm weather keeps the temperatures comfortable during daytime hours, giving you plenty of time to enjoy all that the Smithgall Woods area has to offer. Only 5 miles away from Helen, the Smithgall Woods area can be quickly reached from Cedar Creek. To get there, go southwest on Zeppelin Strasse, until you reach Brucken Strasse where you will make a left. At Edelweiss make another left and that will take you to GA-75 N. Turn right and follow this road until you reach GA-75Alt N, where you will make a left. Continue on GA-75Alt N for 2.5 miles where you will turn left onto Tsalaki Trail Rd. This road will lead you directly to Smithgall Woods. Have you visited some of the popular Helen Georga attractions within Smithgall Woods State Park? Feel free to share any tips or advice to future vacationers in the comments section.